Gorgeous style B movie poster with unique art created for the first Japanese release of the animated DISNEY classic movie. Format : B2 20x28.5 inches (51x73 cm). Will be sent rolled in a sturdy tube. This is one of the many movie, music, comic book art and advertising/Olympic posters which can be found at ILLUSTRACTION GALLERY - ART THAT POPS! A brand new online poster gallery devoted to the celebration of the poster artists behind the art of the movie, music and comic book. Feel free to contact the gallery for any queries/questions. ILLUSTRACTION GALLERY - Art That Pops! 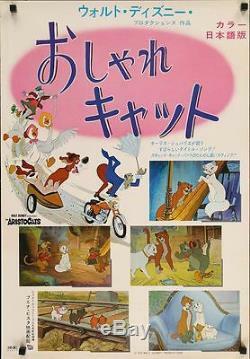 The item "ARISTOCATS Japanese B2 movie poster style B WALT DISNEY Vintage 1971" is in sale since Wednesday, August 2, 2017. This item is in the category "Entertainment Memorabilia\Movie Memorabilia\Posters\Originals-International\1970-79". The seller is "illustractiongallery" and is located in New York, New York. This item can be shipped worldwide.